We get asked all the time by visitors if there are any sharks in Gran Canaria. Most want to know if it is safe to swim in Gran Canaria, while some want to know if they can dive or snorkel with these beautiful animals. The good news for all is that yes, there is a small population of a very docile, angel sharks in some parts of the Island and also yes, it is perfectly safe to swim in the sea without any fears that these sharks will attack. Angel sharks are among the most placid, docile and non-aggressive sharks anywhere in the world. Their common name gives it away .. Angel Sharks ..mainly named because of the shape of the body when seen from above. So just how 'shark infested' is the water around Gran Canaria? Is it safe to paddle in the sea in Gran Canaria? Is it safe to swim in Gran Canaria? Is it safe to go in the water with a cut or open wound on your leg? The answer is that the waters are SAFE!. Our small population of endangered residents angel sharks rarely come into shallow water and avoid human contact. Attacks by sharks across the Canaries are extremely rare (less than one every 15 years) and never fatal or life changing, and you have no need to be worried by their presence in deeper waters. Angel Sharks are bottom dwellers, who rarely swim near to the surface, and are rarely seen by swimmers or snorklers. Angel Sharks are bottom feeders and they only have a very small mouth. Angel Sharks are selective predators who prefer just one type of fish - sardines, so they have no interest in us as a dietary supplement. Angel Sharks are small and scared of us. The average size is about 1.2 meters long, but when compared to divers or swimmers, we pose more of a threat to them and so they hide or flee. 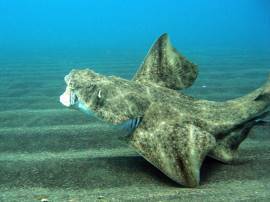 Angel Sharks are critically endangered and listed on the IUCN 'Red List' of endangered species. They can be found if you know where to look, and probably number only 3-4 per square kilometer. Our diving centre in Arinaga has been diving with Angel Sharks for ten years now, and for the last couple of years our experts have been pooling our observations with the University of Las Palmas. During that time we have had hundreds, if not thousands, of sightings of Angel Sharks. Our Instructors dive with them when they are swimming; we find them stationary; and we dive with them at night! In all these years we have never had a contact where anyone has had an unprovoked attack by angel shark. 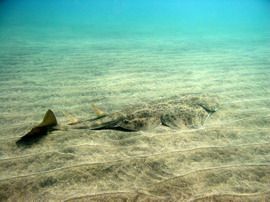 On a couple of occasions they have been annoyed by our presence, and made themselves look aggressive, but apart from a few warning 'feints', and two or three bumps, we have only had one actual 'bite' by an angel shark! This was when our instructor was pointing out the location of shark in the sand, it mistook his finger for food and sampled it. The wound was similar to that imposed by a dog bite, but he still has all his fingers!. So come and dive with us without fear, as none of our guests has had a problem with these beautiful creatures, and we will happily use our hands and fingers to point them out to you. There are also rare contacts with two other sharks, hammerheads and blue sharks. These are however deep water species and rarely stray into shallow water. If you go deep sea fishing, or boating several miles off shore you may if you are lucky encounter these over the deep water trenches that surround Gran Canaria. One of the very few encounters with other sharks was on Christmas Day, 2015, a Spanish lady was bitten by what was judged to be a deep water Silky shark while swimming, just before dusk, just 75m from where I live. The UK press, starved of good stories at Christmas, over-reacted and did their best to blow the incident into a major issue with headlines like 'Tourist bitten by Shark'. The Spanish lady, who is a Doctor, was shaken, but did not suffer any life-changing or life-threatening injury, and all the local experts believe that it was a 'once in 50 years' incident as nobody has ever seen a Silky shark in normal swimming and diving areas. I have spoken with local divers, marine biologists and safety experts and apart from the physical evidence of the bites, no-one could believe that the incident took place. Nothing like this has been recorded for over fifty years before, or since. We can't even find the Silky shark, and thousands of people bathe safely off the shore of Gran Canaria every day of the year. Sharks are certainly misunderstood and create apprehension and fear in a great many people. To make those of you who are afraid feel a little bit better, here is a world-wide list of things are much more likely to kill you than sharks! So yes, it is safe to bathe on the beautiful Canarian beaches without any fears of being dragged under by any ferocious carnivore. And you can jump into the sea from your pirate cruise or snorkeling trip, safe in the knowledge that any angel sharks or even silky and hammerhead sharks in the area are probably moving away from you, or hiding absolutely still ten or more meters underneath the boat, waiting for you to leave. And you can ignore the video of 'Shark Diving in Fuertaventura' which shows some Guitar Sharks .. these are not native and I think that the footage was taken in a controlled environment not the open sea. As for the attack in Arinaga, most experts believe the shark was moving between two open water fish farms a few km away, areas which have been known to attract deep water sharks, but very definately off the tourist areas. We will continue to swim and dive in Risco Verde, and even do some night dives there. Being a critically endangered species on the 'Red List' means that any encounter with an angel shark (squatina squatina) is a privilege. We don't know how long they live but estimates of 20-30 years will give them a similar lifeline to other sharks. This means that adults will have almost certainly encountered humans before .. and they are wary of us. Ed points out an angel shark next to the rock! Despite their size, angel sharks are experts at concealment - they come to a stop and then wriggle themselves down into the sand, and with a final flap of their fins, cover themselves in sand. They are now very difficult to spot, and may remain in this one place resting, and waiting for food to come to them, for many hours. We have had several examples where we see an angel shark one day, and if it is not disturbed, find it in the same place the next day. 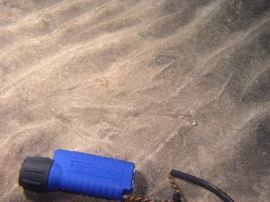 The next group of photos show how they disguise themselves in the sand. We tend to see more individuals either above the sand, or on rocks, or actually swimming, in the winter months when the water is colder. They will sometimes approach divers, but when they get to within about 5 meters they invariably change course and swim away from us. They have a 'normal speed' which divers can just about keep up with, but if they feel threatened they will move up a gear and with a few flicks of their tail accelerate away from you. Face to face, can you see both the eyes and the breathing holes above the head? So please respect our angel sharks! If you find one covered in the sand - please leave it there as it may be digesting a meal or waiting for the next meal to come along. Every dive with an angel shark is a privilege granted by them, so respect their privacy, don't chase them excessively, and always give them an exit or plenty of space. Plan your dive with angel sharks!